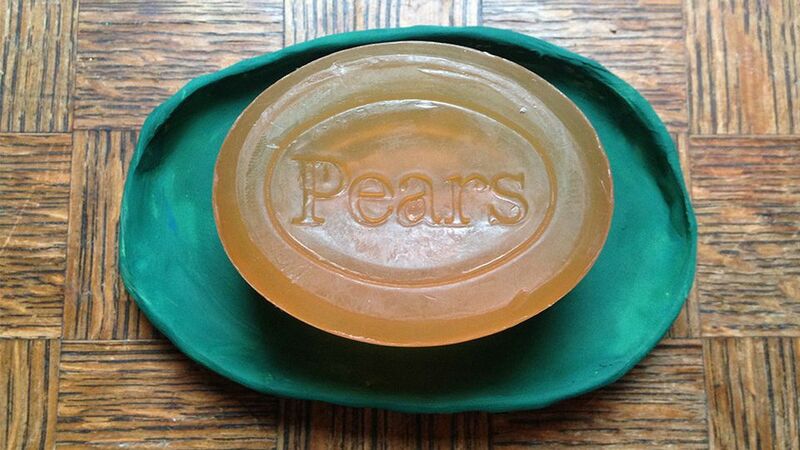 This easy ceramic soap dish is a great project for beginners in the craft. Work with a small amount of clay to create a homemade piece for your bathroom or kitchen. You’ll first need to start with a small ball of wedged clay. Wedging clay means making sure all of the air bubbles are removed from the clay (so they don’t explode in the kiln). Once your clay is properly wedged, you’ll need to grab a rolling pin and gently roll it out to around a centimeter thick. To get the correct measurements of the soap dish, use your regular bar soap as a guide, although you can make your soap dish any shape you like. Be aware you’ll need a size that sits nicely on the side of your sink. Place the soap on the clay (still in its packaging to keep it clean) and use a sharp wooden pottery tool to cut a shape (approximately two centimeters) around the soap. Once you’ve cut out the main shape, you’ll need to score an inner line (making sure it is just scored and not cut right through). Leave approximately one centimeter around the soap, as this is the line you’ll fold up the clay from. Take the soap off the clay and gently start folding up the edges of the clay from the fold line, working your way right around the soap dish. Make sure that the edges are the same width all the way around. Smoothing the edges is really important here for a lovely finish to the soap dish. Use your fingers or a sponge and a bit of water (don’t make it too wet). A curved wooden rib can also help to create a smooth finish. Once you’re happy with the shape and smoothness of your soap dish, you’ll need to make the drainage holes. Mark them out first with a pencil or the end of a sharp wooden pottery tool to make sure they’re all in even places. Dependent on the size of the pottery dish, six holes should be enough. To cut the holes properly, use a properly angled ceramics hole cutter. This will produce the neatest, sharpest results. The soap dish is complete. Leave it to dry until leather hard. Leather hard indicates the clay has dried enough to be trimmed. Once your soap dish is properly dry (it should be bone dry), you can bisque fire your piece. The clay at this stage is called greenware (which is quite Iiterally unfired pottery). Pottery in this state is at its most fragile, so be careful when loading it into the kiln. Bisque firing is the first firing a ware goes through in the kiln, removing all its moisture and turning it from clay into a ceramic material. The rough temperature a kiln will reach for a bisque firing is 1730 F.
You'll need to wait until the kiln is completely cool until you remove your pieces. Pick your favorite color or the color that best matches your bathroom decor for your glaze. The glaze is extremely important, as you'll need your soap dish to be completely waterproof. You have two choices: use underglaze with a glossy transparent glaze on top, or just a normal dip glaze. This choice really comes down to preference. One benefit of using an underglaze is that it tends to turn out the exact color as it is in the pot. Once you've chosen and painted on your underglaze (usually three coats are needed) then you'll need a couple of coats of transparent glaze, to make sure it's waterproof and to give it a glossy finish. Dip glazing is the quickest and easiest option, as you just need to dip your piece in your glaze bucket once (controlling the time you leave it in for) and there's no need for a transparent glaze on top. Once you've finished your glaze firing and your soap dish has cooled, you're finished with the project and ready to display your new ceramic dish.